You are here: Home / General Market / What should we do? The Dow is down 40% since its all-time high set on Thursday, October 9, 2007 and the NASDAQ is down 45% its 52-week high set on Wednesday, October 31, 2007. The NASDAQ’s all-time high was set on March 10th, 2000 at 5132.52; a 69%+ decline calculated using Friday’s close of 1,552.03. That’s the question everyone seems to be asking. A number of people have e-mailed me, sent me messages on Facebook or have asked me in person what I am doing or what they should do. It’s not a simple answer because everyone’s goal is different and the road each of us takes will vary. So, the best way for me to answer this question is to tell you what I am doing. Let’s start at the automatic investments: 401(k) or IRA. Both my wife and I have these accounts and we will continue to fund them, especially with employer matches (why not – it’s free money). For example, my company matches 100% of the first 3% and then 50% of the next two percent. That’s a 5-to-4 ratio for the first 5% of my salary or in other words, I get an 80% return on the first 5% I add to my account without making a move (profit sharing is another perk that gets added to this account as well). For example, a $100,000 salary would get $4,000 added by the employer for the first 5% or $5,000 invested into that 401(k). I suggest that anyone that doesn’t currently participate in a plan that offers a match is not making a great decision (in my opinion). Enroll and start making “automatic” deposits into the account; every year wasted is a year you lose out on an employer match and more importantly, the power of compounding. I don’t think this is the best option to grow wealth but it’s not bad when you get a match. What about my individual stock investing account? First, I always run to my personal library of “yellow highlighted” stock market books in times of extreme pessimism or extreme optimism. Why, because I can pick the brains of men and women who have gone through similar situations and learn from their experiences. In particular, I read Martin Zweig, Jesse Livermore, William O’Neil, Gerald Loeb and Victor Sperandeo (see reading list for details). I’ll also glance at pieces written by Warren Buffett and Peter Lynch for fundamental pointers. Benjamin Franklin once said: “The things which hurt, instruct” – so pay attention to the indicators mentioned below and be disciplined and flexible, poor market speculators are never flexible and rarely follow the tape. It seems that every indicator is hurting big time so listen to what they are saying. Let’s get started: I am analyzing my stock screens every week (nightly when possible). I am trying to understand the flow of the market, I’m looking for market leaders and industry groups that may want to take the lead when a bull market does decide to begin. Bull markets (up-trending markets) begin when one or more of the major indices are up at least 3% and then have a follow-through 4-10 days later with similar action. This is the first parameter we must look for. Advance/Decline measures the ratio of rising stocks to falling stocks on – in Zweig’s examples – the NYSE. It excludes stocks whose price does not change. 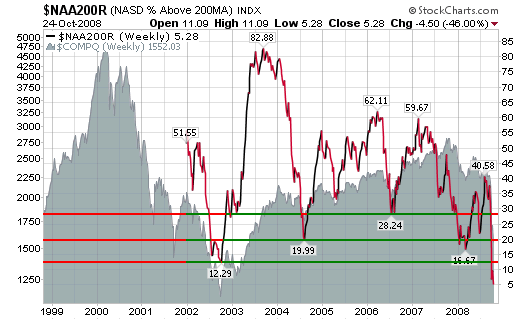 If 2000 stocks rise and 500 stocks fall, the A/D ratio would be 4. Zweig uses the example of the rare event of a 10 day A/D ratio of two or more (2-to-1). If you had invested in the market as a whole each time this has happened, in the following 6 months, your investment would have risen by an average of 19 percent. Up Volume is the total number of shares whose price rises. On the NYSE, the daily volume runs into billions of shares. Zweig has found that when 90 percent of the volume (excluding volume in shares whose price has not changed) is upward (9-to-1 ratio), significant upward momentum in the market is likely. The Four Percent Model Indicator uses the Value Line Composite Index (Recently, I use the Value Line Arithmetic Index (EOD) or symbol $VLE on StockCharts.com), which can be found on the web or in financial pages of newspapers. 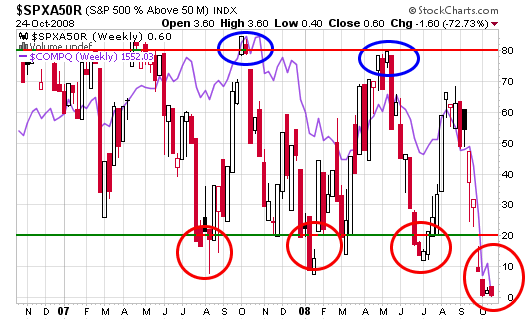 The model makes use of the weekly close of the Value Line Index. 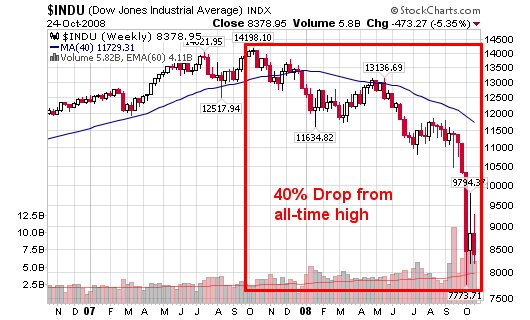 A buy signal is generated when the index rises four percent or more from the previous week. 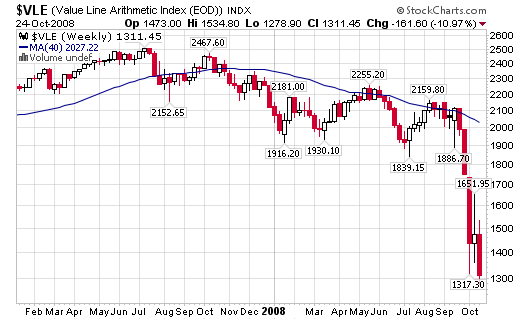 Similarly, a sell signal is indicated when the index falls four percent or more from the previous week. I am paying attention to Zweig’s indications as well as the New High – New Low Ratio (NH-NL), the general action among the major indices (mentioned above) and the market leaders. Other charts of interest that suggest a buying opportunity is now is the percentage of S&P 500 stocks above their 50-ma. 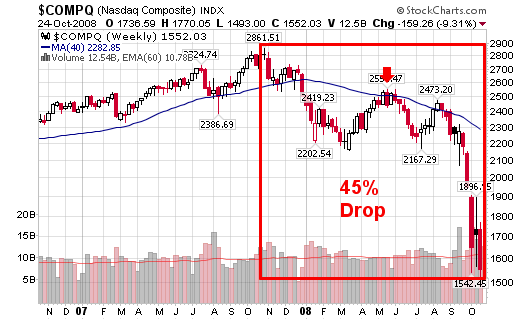 and the percentage of Nasdaq stocks above their 200-d m.a. which is at its lowest level since it started to be tracked by my software. My next blog post will focus on the stocks/ industries that have the strongest relative strength and best values according to my screens. For a raging bull market (up-trending market), you need falling interest rates, probably an economic recession, lots of cash on the sidelines, good values in the market-namely, low price/earnings ratios, and a great deal of pessimism because it means there’s an abundance of cash. – Martin Zweig – We currently have all of these conditions. Hang in there, no one truly knows when the carnage will end but historic opportunities are setting up right in front of our very eyes. I may be a little early but I will definitely be prepared. Let’s nail this sucker together! Superb review of the technicals. I’m seeing things the same way. What exactly does “of two or more” mean? I know what a 10 to 1 A/D day is but I’m not sure what this 2 to 1 means. He’s just saying a 2-to-1 ratio for 10 consecutive days. Has happened less than two dozen times throughout history (very rare). We will be following your posts intently! Great analysis of the market. I’m hanging on your every word and thank you in advance for your guidance in these historic times where if we don’t blow it, we may be able to turn our finances around! low price/earnings ratios, and a great deal of pessimism because it means there’s an abundance of cash. – Martin Zweig – We currently have all of these conditions. Cheap compared to what? What’s the basis? 2009 vs. 2008 or 2009 vs. 1978? High to one can mean low to another. It’s difficult to gauge. Follow the tape action.